Special hours: See our class schedule on our website. Other hours by appointment. Sandy Keane’s Dance Studio provides the Sioux City area dance education classes including Ballet, Tap, Jazz, Baton, Tumbling and Pom. Sandy Keane’s dance studio provides the Sioux City area with some of the best dance education services that you will find. We offer a variety of classes including Ballet, Tap, Jazz, Baton, Tumbling and Pom. We take students of all ages currently we have ages 3 to 93 and teach them the basics of dance and choreography to more complex techniques of dance. These techniques have been displayed by some of Sandy’s students while performing in the Moscow Ballet’s Great Russian Nutcracker with Sandy acting as the dance coordinator at the Sioux City Orpheum Theater. The studio dancers stay busy throughout the year performing in a variety of competitions, performing for community events and of course our annual recital. Producing a recital is a monumental task and those of us who work with the students throughout the year know what is involved in giving a student their magical moment on the stage – a moment that will last a lifetime. 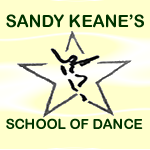 Sandy Keane’s School of Dance was established in 1973 and has been going strong for 41 years. Sandy has been dancing since she was three years old and a graduate member of Chicago National Association of Dance Masters (CNADM) of which she has been a member since 1971. She has a PASSION and LOVE for dance that she loves to instill and pass on to others. Click the link for our dance schedule! Remember we have dance merchandise for sale right here in our studio: including leotards, dance outfits, make up, picture frames and so much more!